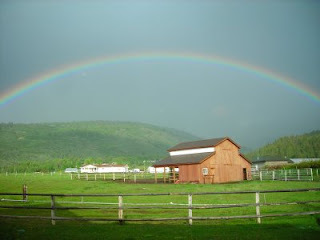 Rainbows have been a frequent sight for the past several weeks around Driggs. Weather reports showed that we had measurable precipitation for 21 consecutive days, and this on the heels of a big winter and wet spring. Suffice it to say that area reservoirs are full, ground is saturated and we're all ready for summer sunshine! 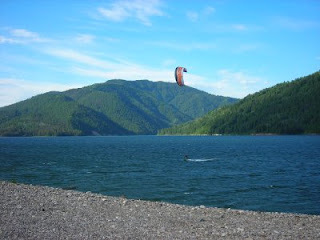 Speaking of reservoirs: I was driving along Palisades one morning last week, and suddenly saw a guy out kite boarding. Not something we see everyday around here. He was absolutely rockin' it, pouncing on strong early morning winds and rare clear skies. I wish I could have stayed longer to grab more photos, and I hope he had a thick wetsuit...the water is COLD this time of year. Work took me to Star Valley, Wyoming last week, which rivals our own Teton Valley, Idaho for natural beauty. 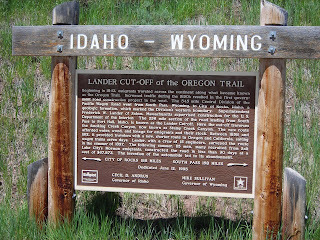 I came upon this Lander Cutoff Trail historical marker at the mouth of Stump Creek Canyon, and photographed it to remember the details. Can you imagine 115 men building 345 miles of wagon trail across rough western country - by hand - in less than 90 days? That is absolutely mind-boggling stuff. And to think they did it all without cell phones and computers! :-) Ha. Today, it would take us 90 days just to schedule our first meeting to discuss the feasibility of such a project. Somewhere along the line, we've forgotten how to get things done. Returning to topic, we did have a handful of nice days this week, and with July around the corner that should become the norm for a while now. The valley is exploding to life, the greenest I've seen it in my 15 years here. Mosquitoes are more active than usual, but we can live with that for a month until it freezes at night again. Rivers remain high and muddy, but should clear up for fishing within a couple of weeks. 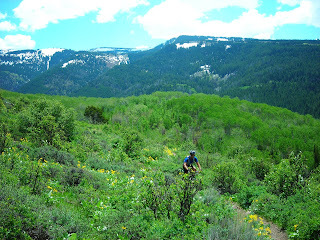 Golf courses are in great shape, and mountain trails are finally emerging. It's time to savor summer...I'll be on my bike if you need me. During one of my former lives, I spent about a year in San Diego. It was a phase during which I learned many things: how to drive in real traffic, business law, beach behavior (fun), the true Steve Garvey story, and more. I also learned about a SoCal weather phenomenon called "June Goom," which occurs during early summer when ocean temperatures are still cool, ambient air temperatures are warming up, and the result is frequent coastal fog. Uggh. Segway to the present: we are experiencing an Intermountain version of June Gloom right here in Driggs, Idaho once again this year. Persistent rain, occasional snow, interminable gray skies...when will it end? Probably a week before the 4th of July, when it will suddenly be brilliant summer and we'll wonder what the problem was. Let us hope. In the meantime, we master the art of squeezing in activities between squalls. 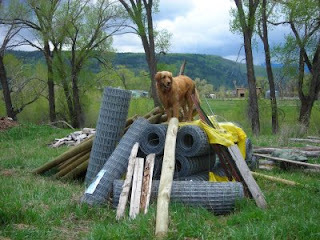 Hey, the sun's almost out, quick let's take the dog for a hike...but not too far away from cover. Not supposed to rain all day...o.k., a monster 5-hour road bike ride involving Teton Pass a couple of times, and only an hour of rain...not bad. 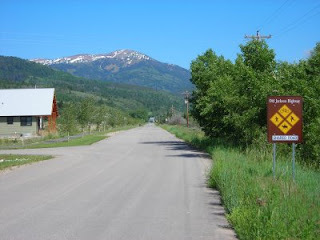 Well, except for pedaling back up the Jackson side of Teton Pass, which was misery. But it was voluntary misery, and beat sitting on the couch watching it rain. A few early-summer rituals have been accomplished, in spite of the uncooperative weather conditions. Our one-year-old filly, Sugar, got shoes for the first time. Dan the man (a.k.a. 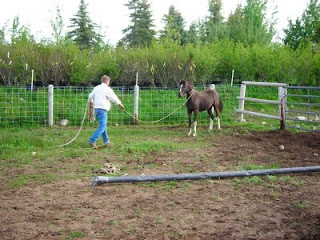 "ferrier") was efficient and effective, and got 'er done. Now we just need the mud to mellow out a bit, and it'll be time to head to the hills for fleeting but oh-so-sweet summer adventures. The wildflowers will be stunning this year...bring it on, please. We're all ready to wear shorts for a few weeks. 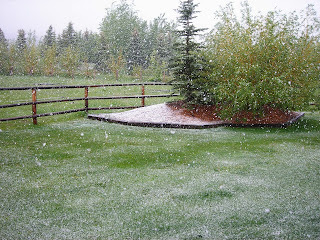 Conditions and activities here in Driggs have been a little of this, a little of that lately. 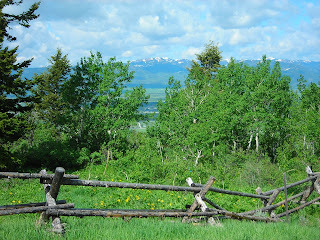 It was our 15th Memorial Day weekend in Teton Valley, Idaho, which usually means snow one day. We escaped the white stuff this year, but spent the better part of three days dodging thunderstorms. It definitely could have been worse. Joanne and I snuck in a mountain bike ride, did chores, yardwork, and bigger projects like moving sprinkler pipe at the pasture (always a joy). All in all, not a bad long weekend. When the sun is out, it's absolutely beautiful this time of year: snow up high, wildflowers emerging in the foothills, and green grass in the valley...finally. Bring on summer! One of my favorite evening walks is a stroll down by the Teton River. Waterfowl abounds, and views of the mountains are nearly 360-degrees. 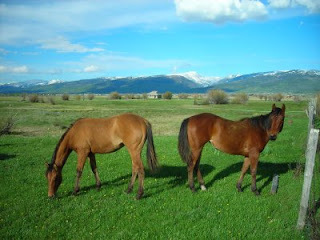 Last week, several horses were just beginning to graze a particularly scenic section, right before sunset. The light was so rich and color contrasts so vivid, I had to just stop and observe. Gotta love those moments.